Sometimes I test out recipes and they simply don’t work. 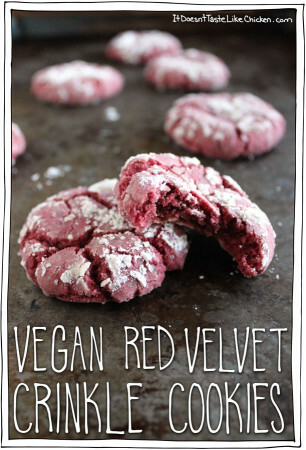 This week I have been toying around with two different Valentine’s Day inspired recipes, and in both cases, I tried them twice and all attempts failed miserably. Grrr… So after a little frustration and wasted ingredients, I scratched those ideas and decided to do something incredibly easy and fail safe. 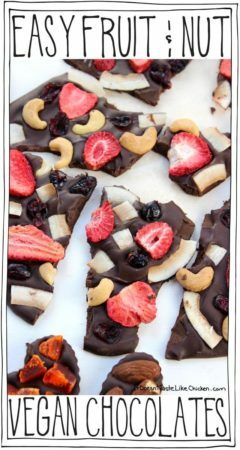 Easy Fruit & Nut Vegan Chocolates! I’m so, so happy that my other recipe attempts failed because these chocolates are just perfect. 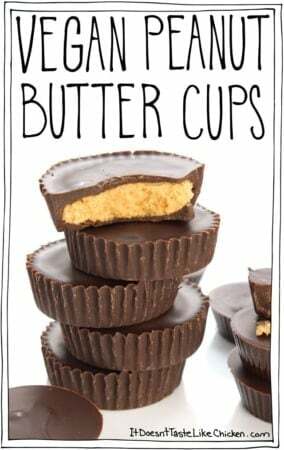 Very easy to make, and the end result is totally wow-worthy, both in look and in deliciousness. I mean, chocolate. What more do I even have to say? Then the chocolate is topped with salty, crunchy nuts, and sweet, chewy dried fruit. Not only does it make the chocolates so beautiful and unique, but I cannot stop eating these treats. Flavour combo explosions going on in my mouth over here! 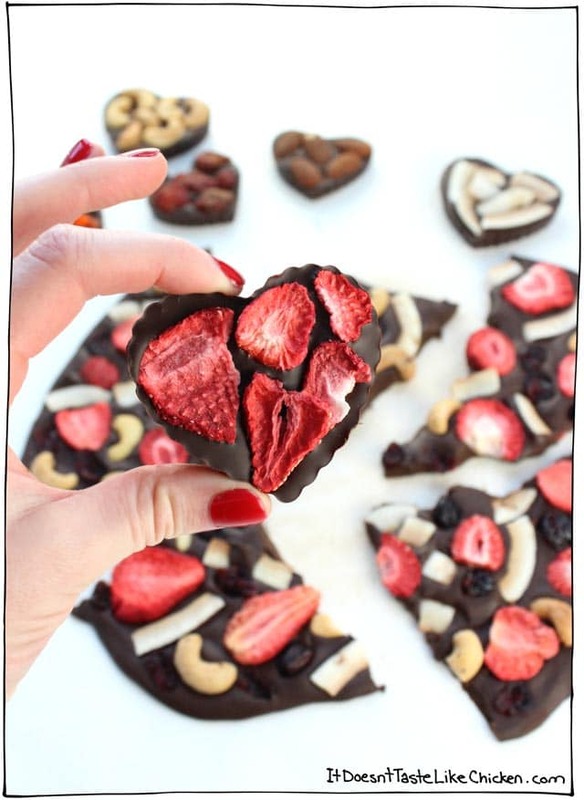 You can use a chocolate mold to make whatever shaped chocolates you like, or you can just use a piece of parchment paper on a baking tray and make vegan chocolate bark. I think the coconut chips are my favourite… no, the roasted salted cashews… no, the tamari smoked almonds…no, the chewy dried strawberries. I can’t decide! So much sweet-tooth satisfying goodness. 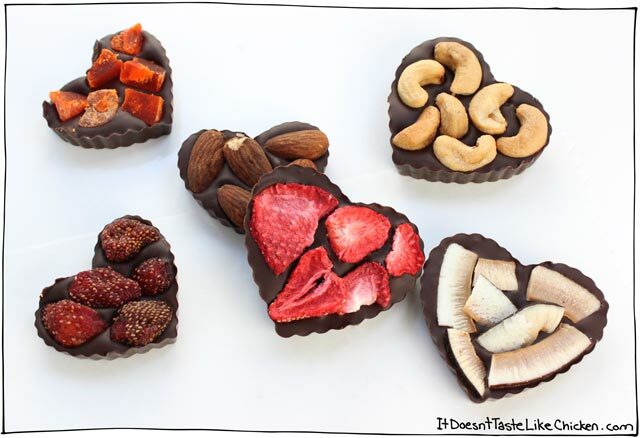 To make easy fruit & nut vegan chocolates: The key is to have a variety of dried fruit and nuts. You don’t have to have a lot, even just a couple different options would do, it’s all about the flavour combos. I ransacked my pantry and dug up tamari smoked almonds, freeze-dried strawberries, roasted salted cashews, roasted coconut chips, dried pineapple, craisins, dried papaya, and dried strawberries. (P.S. if you haven’t ever had dried strawberries, they are basically like eating the best gummy bears ever, I’m obsessed with them)! 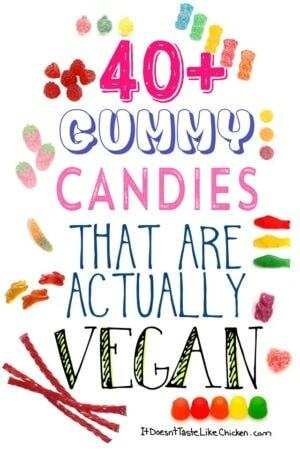 If you are making these for kids (grown-up kids or little ones), you could even stick vegan candies or cookies in the chocolates. The options are endless! 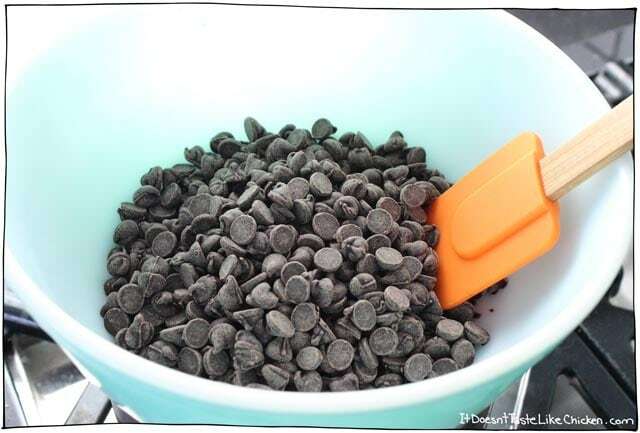 Now that you have found delicious toppings, all you have to do is add your chocolate chips to a double boiler to melt the chocolate. To make a double boiler, just fill a pot with a couple inches of water, then fit a heat-proof bowl on top of the pot. The bowl shouldn’t touch the water in the pot. I used a Pyrex bowl, but a stainless steel bowl would do just fine as well. Bring the water in the pot to a simmer and melt the chocolate slowly. 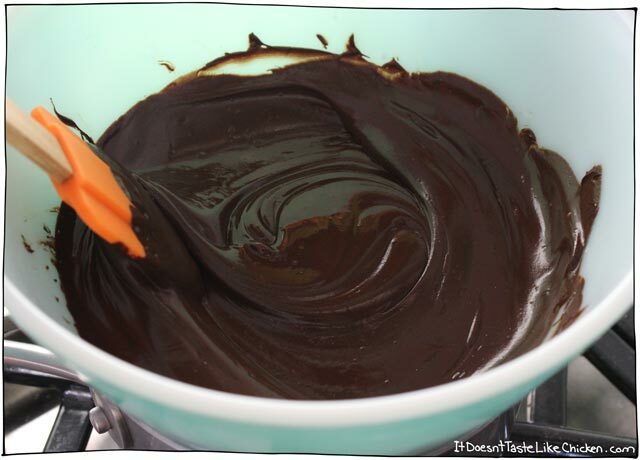 The reason you use a double boiler is so the chocolate doesn’t burn. Alternatively, you could melt the chocolate in a microwave. 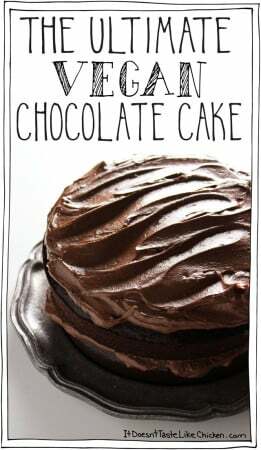 Just be sure to do it in small bursts so the chocolate doesn’t burn. Once your chocolate is melted, pour into the chocolate molds. These molds were pretty deep so I didn’t fill them all the way. I couldn’t find the exact mold that I used online, but this one is pretty close if you are looking for a similar heart shape. 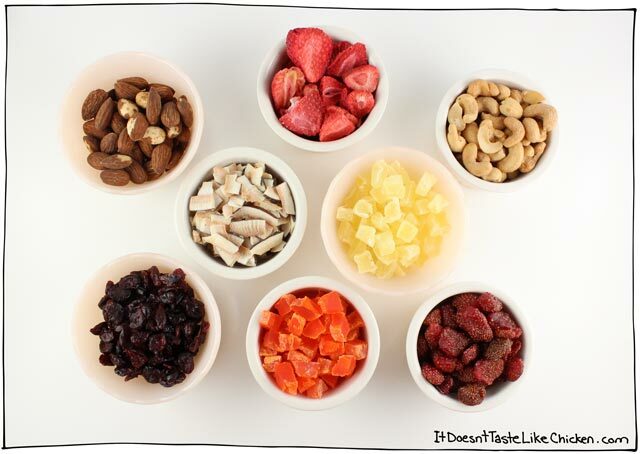 Then just take your dried fruit and nuts and lightly press your toppings on top of the melted chocolate. If Valentine’s Day hearts aren’t your thing, you could use any shape you like. I recommend using big molds for this recipe as you want room for the toppings. 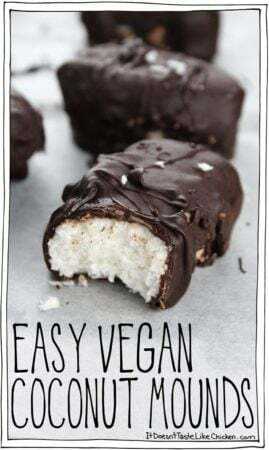 Alternativly, you could place a piece of parchment paper on a baking tray, and pour the chocolate onto that. 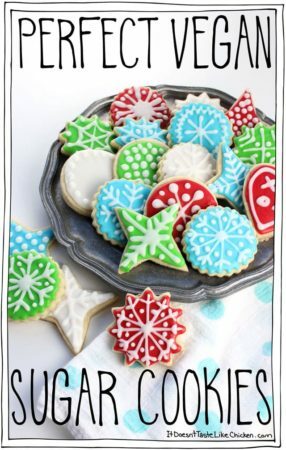 Spread it with a spatula so that it is about 1/4 inch thick. Then just lightly press your toppings of choice on top. So PRETTY! Pop your chocolates in the fridge to set for 30 minutes to an hour. Once set, pop them out of the molds, or for the chocolate bark, just peel off the parchment paper and break into pieces. 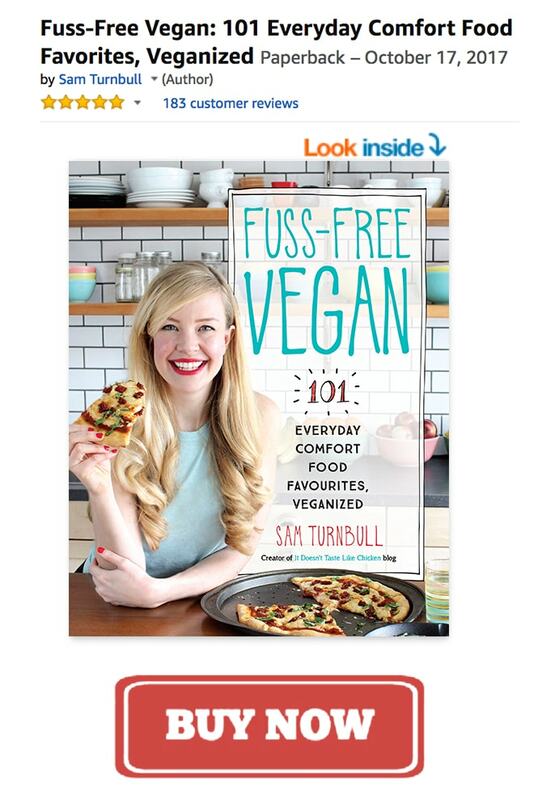 Store in an airtight container in the cupboard for up to a month (probably longer). This makes a fabulous gift, just put in a pretty bag and tie with a bow. 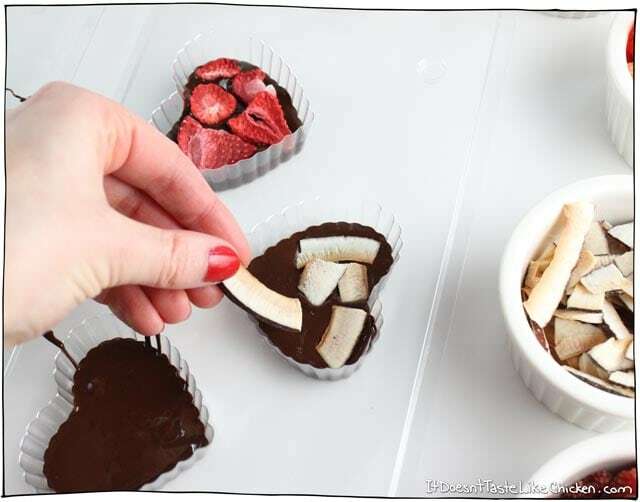 This Valentine's Day gift recipe is so incredibly easy, just melt dairy-free chocolate chips, pour into a mold or onto parchment paper, then top with your favourite dried fruit and nuts. Melt the chocolate chips in a double boiler. Alternatively, you could melt the chocolate in a microwave. Just be sure to do it in small bursts so the chocolate doesn’t burn. 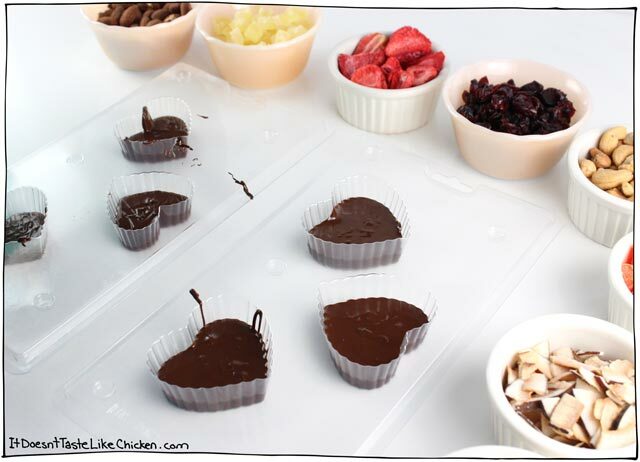 Once melted, pour the chocolate into the candy molds, then lightly press your toppings on top of the melted chocolate. For chocolate bark, line a baking sheet with parchment paper, then pour the chocolate onto that. 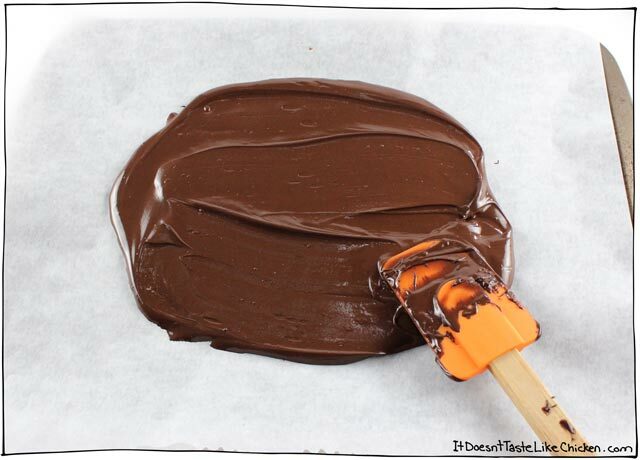 Spread it with a spatula so that it is about 1/4 inch thick. 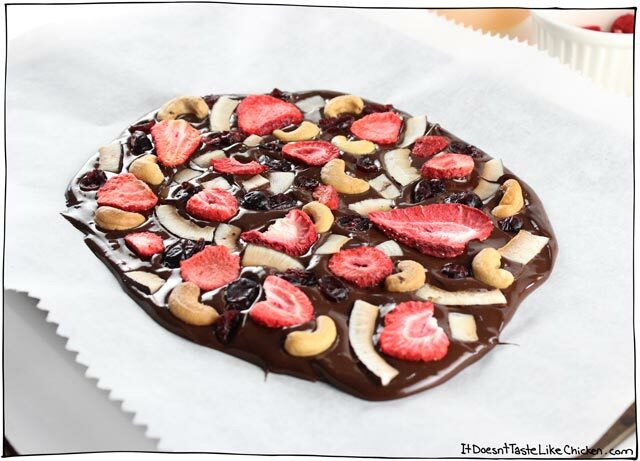 Lightly press your toppings of choice onto the melted chocolate. I used 2 cups of chocolate chips, but there are no rules here, you can melt as much or as little chocolate as you like.